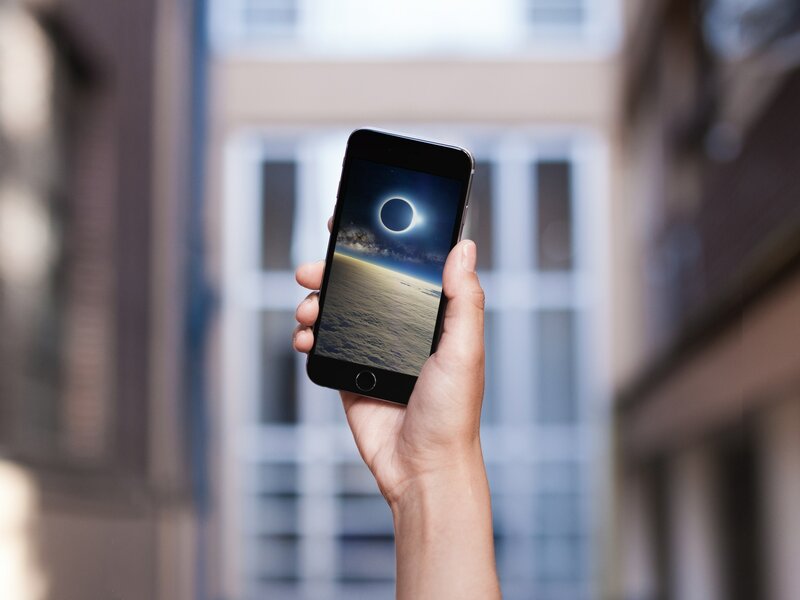 You can take photographs of today’s solar eclipse with your iPhone without having to buy a special solar filter to protect the lens, a company spokesperson recently told USA Today. “You could point your iPhone at the sun right now to take photos and the camera’s sensor and the lens would not be damaged. and the same is the case for the solar eclipse,” the article quotes Apple as saying. Wearing a special solar eclipse glasses during today’s event is necessary in order to protect one’s eyesight from the extreme harshness of the light. However, you won’t have to tap a solar filter over the lens because you’ll be looking at the images of the eclipse on the screen. Focal lengths between 400-800mm are recommended for NASA-like shots. But the iPhone camera is a 28mm wide angle so the sun itself will be a very minor object in your photos. Still, folks using larger cameras such as Canon or Nikon DSLR and a large zoom “would run into trouble”, says Apple, because of the huge multiplication factor hitting the big lens. In case you’ve been sleeping under a rock lately, a total solar eclipse will be crossing from coast-to-coast in the US later today. It is expected to be the most viewed eclipse in history. Such an event could look especially cool with time-lapse photography, available from the stock Camera app on your iPhone. Simply leave the camera running for a good ten minutes before totality and ten minutes after for a nicely sped-up time-lapse video running about thirty seconds long. If you’ll be taking photos of today’s event with your iPhone, are you going to do so using a solar filter or not? Let us know in the comments.